The castle of Haroué is situated 20 minutes south from Nancy, and less than an hour from Metz. 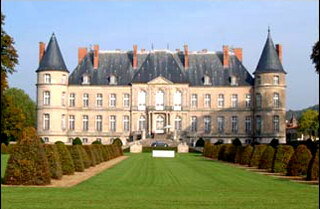 The castle is a unique example of the 18th century French art and the golden age of Lorraine during her independence. Lorraine became French in 1766 at the death of the last Duke of Lorraine: Stanislas, King of Poland. Built on the site of the Cittadel and on a renaissance castle, the actual castle has conserved certain vestiges of the previous ones. Always in the family of "Beauvau-Craon" since its construction by Germain Boffrand in 1720, the castle is situated in a small valley in the centre of the village of Haroué. Such as a calendar, the castle is composed of 365 windows, 52 chimneys, 12 towers and 4 bridges. Considered as a "Palace in the country", the castle of Haroué has always conserved a living atmosphere thanks to the "Beauvau-Craon" who still lives here today.